The popularity of wallpaper has waxed and waned – originally a cheap alternative for those who couldn’t afford fabric on the walls, it soon became so desirable that it was taxed as a luxury item and became, for a while, something for the rich rather than for everyone (see timeline). 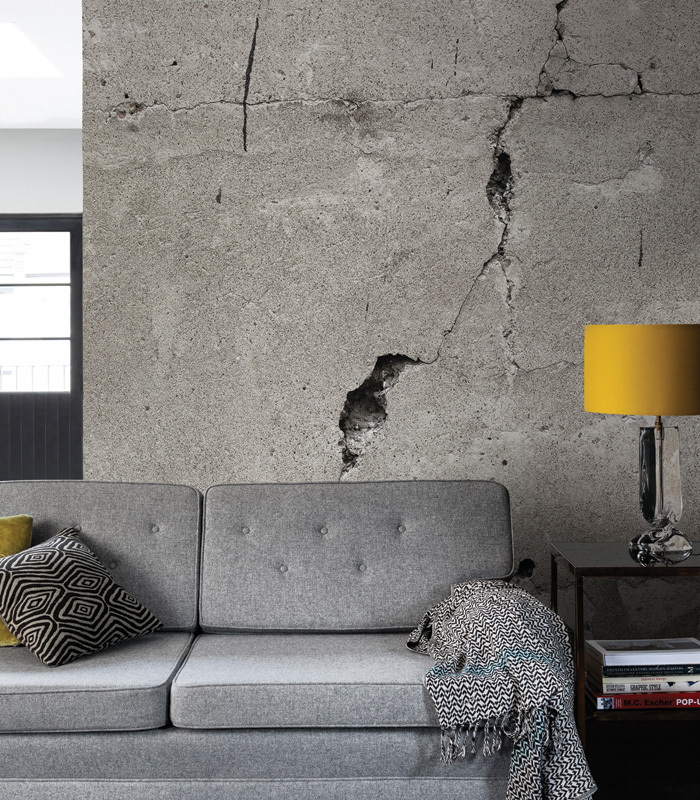 Surface View Cracked Concrete wall mural by Jon Osborne Photography is made to measure. Bluebell Gray uses 70cm-wide wallpapers to create interesting whole-room mural effects like this Kippen pattern. 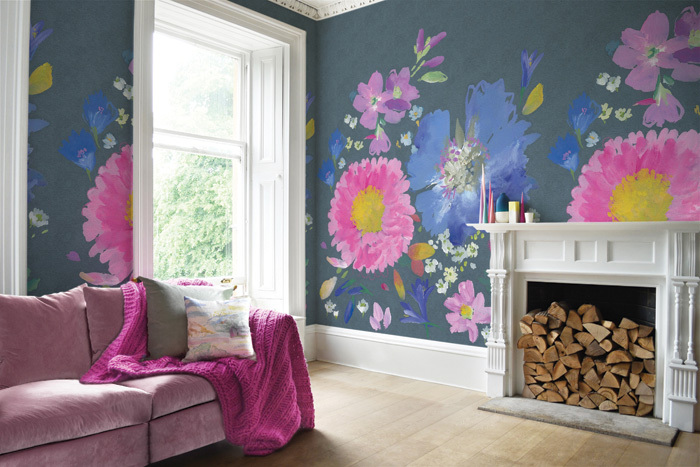 Part of the joy of wallpaper is that with hundreds of thousands of designs to choose from, rooms can be totally personal; but there are some notable trends in play at the moment: Wide width: Much wider papers are increasingly popular as they allow for larger patterns and mural effects. Tougher nonwoven papers that are put up by pasting the wall mean that wider papers are no more challenging to put up than conventional rolls. Élitis uses 70cm-wide wallpaper to create a drip effect with its Perles Parade de Samba washable wallpaper. Retro: Mid-century modern is a trend that shows no sign of dying down. 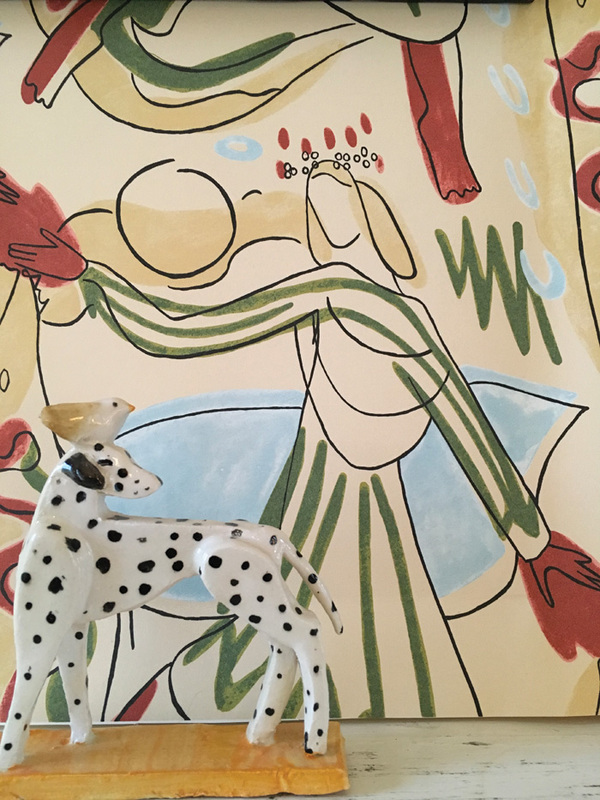 ‘There’s a revival of interest in historic wallpapers at the moment, especially those from the Fifties,’ says Georgina Hamilton of Hamilton Weston. While many architectural wallpapers imitate three-dimensional designs, there is an emerging trend towards wallcoverings that aren’t flat at all. 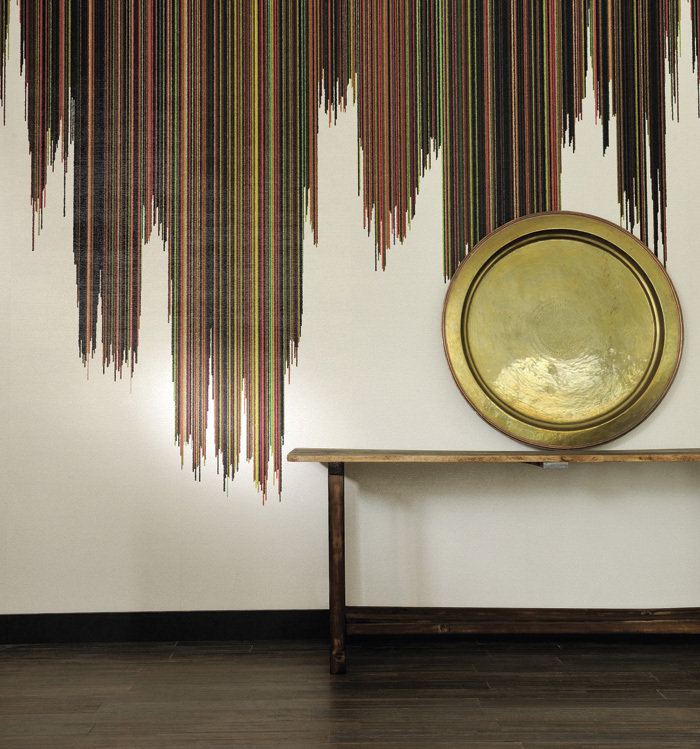 Tracy Kendall, for example, adorns wallcoverings with strips of paper, sequins and feathers to create finishes that are as tactile as they are visually interesting, while Tracey Tubb uses origami and stitching to create innovative wallpaper panels. 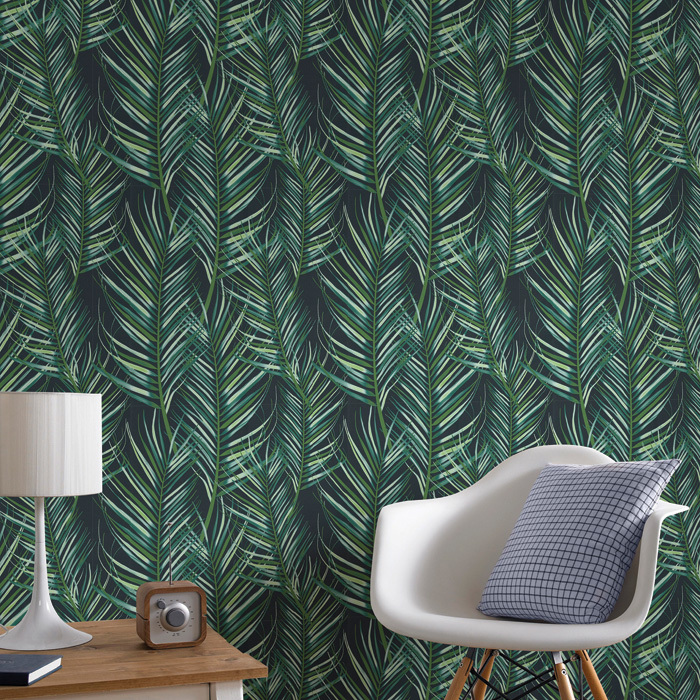 Graham & Brown’s Palm Leaf wallpaper is a budget way of enjoying the jungle trend. The Furniture Show at the NEC this year showed 22-year-old Maneesha Paranagama’s distinctive visions of the wallpaper of the future – studded with broken china and even pieces of dried fruit. 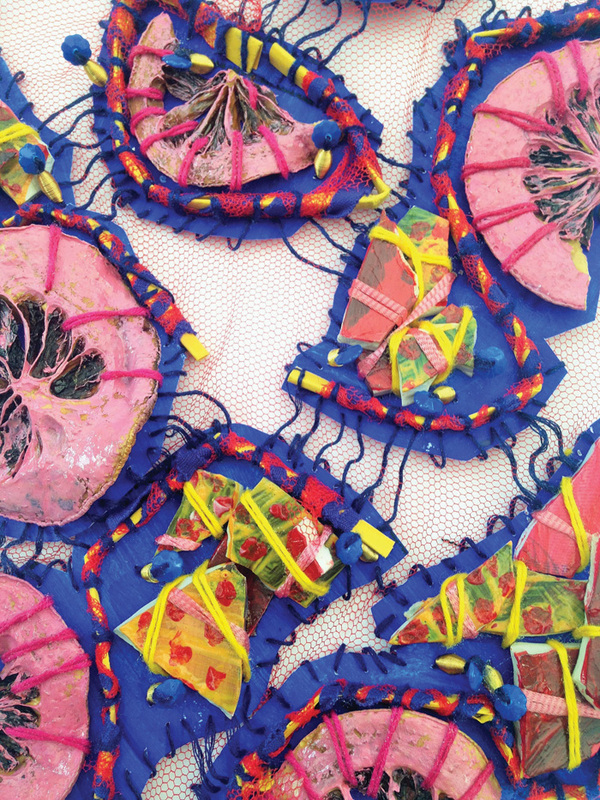 ‘My main intention was to push the limits of decorative artwork and unconventional beauty,’ says Paranagama, who is studying Textile Design at Birmingham City University. 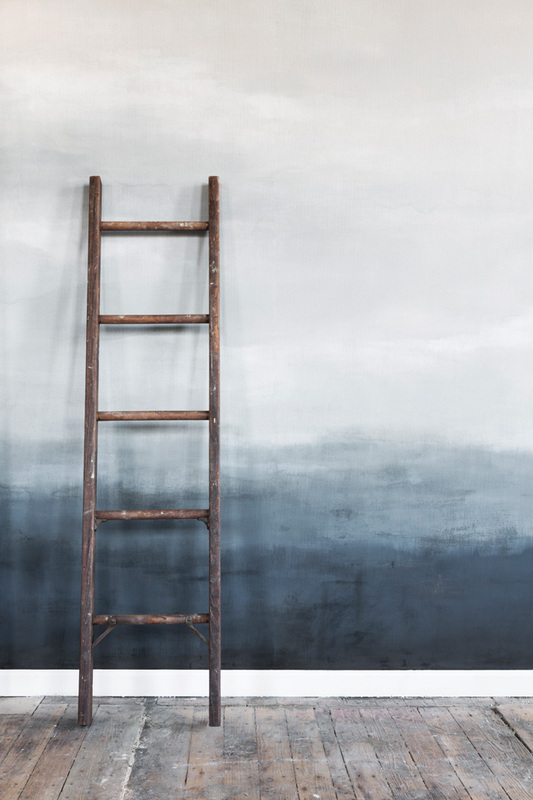 The willingness to use an off-the-shelf wallpaper is likely to diminish as Millennials and Generation Z enter the interiors design market in increasing numbers. Brought up with personalised news and tailored advertising, they will inevitably expect the same degree of personalisation in their interiors – and technology can give it to them and well as interior designers. 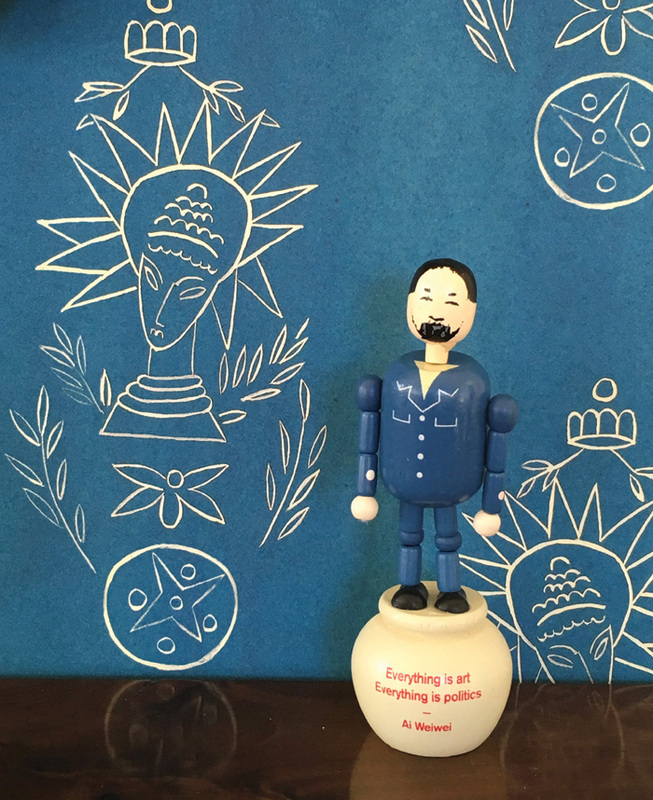 Companies such as Spoonflower (spoonflower.com) already offers the facility to custom-print small amounts of wallpaper to a client’s own design, raising the spectre of lounges decorated with children’s artwork. Others such as Calico (calicowallpaper.com) can create hand-made wallpaper to fit a room’s specifications. 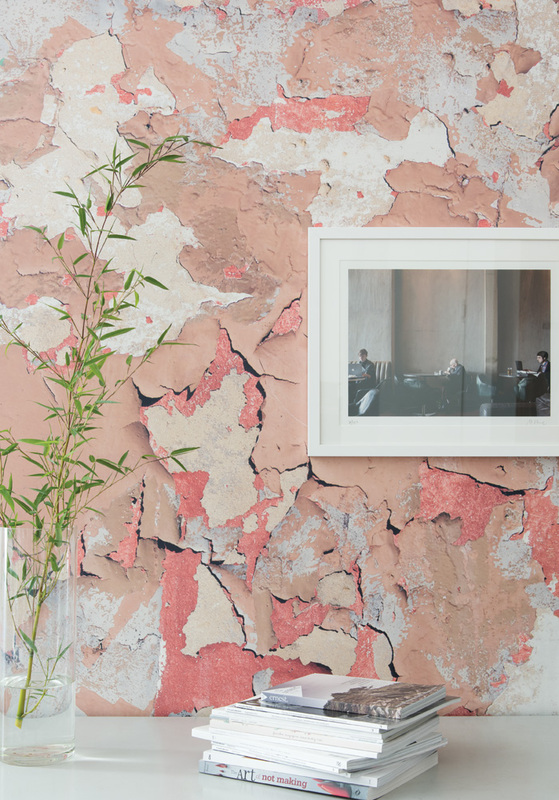 Peeling Paint by Ella Doran hits two trends at once – it comes in extra wide 110cm rolls and it captures an architectural finish in a flat paper. Alongside changes in aesthetics, the wallpaper of the future could also offer functionality that William Morris could only have dreamed of. Electronics company LG has already brought to market its OLED 2.6mm thick TV screen – one day flexible screens could cover a whole wall, offering cinema in the evening while transmitting a conventional wallpaper look during the day. Student of textile design at Birmingham City University, 22-year-old Maneesha Paranagama, showed her wallpaper designs at the 2017 Furniture Show at NEC Birmingham. She creates three-dimensional designs using objects as diverse as dried fruit and broken china. Designers have been playing with the concept of combining wallpaper with lighting for years, but it could finally go mainstream. Meystyle was one of the pioneers and offers wow-factor trompe l’oeil chandelier designs, as well as more conventional papers featuring LEDs. But while LEDs require power, engineers at the University of Surrey have created ultra-thin, flexible solar panels that could act as smart wallpaper – sucking up and storing heat and light during the day, to return it in the evening. 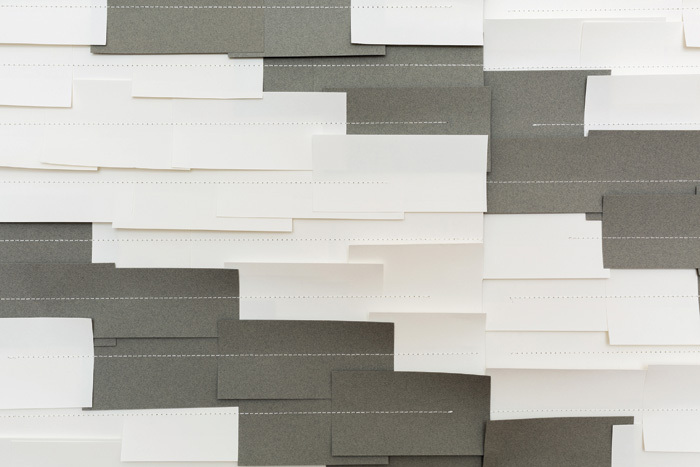 Tracy Kendall is an award-winning wallpaper designer who specialises in three-dimensional paper effects such as Diagonal Room, with paper pieces stitched on to a backing paper. If your next design project is an historic home, you could take a tip from Robert Weston, who often peers in the back of the cupboards or around the electricity meter box looking for hidden treasures. He has spent a lifetime salvaging the tiniest scraps of fragile history and recreating them, and he probably never stops looking. 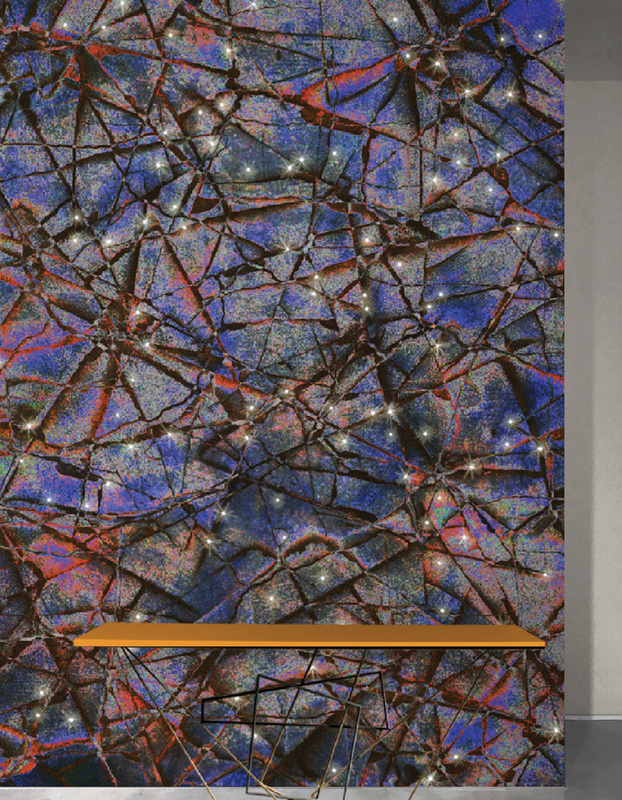 Meystyle has been creating LED wallpaper for more than a decade, but designers are beginning to become more aware of the effects that can be created with illuminated wallcoverings, such as this Fractal paper from the company’s new Conductivity collection. After taking a degree in art and architectural history in his native USA and then studying in the UK and Norway, Weston spent 15 years working as an architectural historian for the GLC, recording and surveying historic buildings across London, with a special interest in wallpaper. 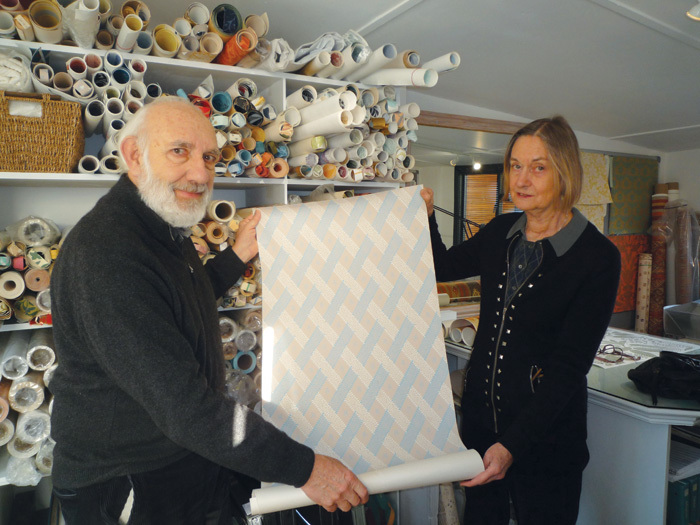 When the GLC was disbanded Weston and his wife Georgina Hamilton – who had a keen eye for detail after a career in film continuity – set up Hamilton Weston to preserve and recreate historic and unusual wallpapers. Bluestone wallcovering from Calico’s Fragments collection is hand-painted with pigments ground by hand from Belgian bluestone and is made to fit the room – a level of personalisation that is increasingly in demand. ‘Wallpapers are always the first thing to go in the builder’s skip,’ he says with regret. Thankfully, despite its fragility, pieces tend to survive – hidden behind suspended ceilings or fitted cupboards, or as a layer than can be dissected from the mass of papers on a wall (British laziness in papering over the previous fashion has been a huge bonus to historians – Weston has separated up to 27 separate layers of paper). From his studio in Richmond, Weston does wonders with wallpapers. Part of his work involves recreating or restoring damaged papers using historically accurate processes for heritage projects and historic homes. He also recreates period wallpapers using both traditional and modern digital techniques for film and TV, with credits including The Woman in Black and Sherlock Holmes. At the moment he’s working on a hush-hush project for Disney, although Hamilton points out that by the time the papers have been distressed and dirtied they often look nothing like they did when they left the studio – she struggled to spot on screen the ones they did for Fantastic Beasts and Where to Find Them. Robert Weston and Georgina Hamilton examine one of the papers they recreated for the Jane Austen’s House Museum. The original was a faulty batch that would have been sold off cheaply. Weston loves both the ancient techniques of block printing – ‘I love history and I like to see these fragments come alive again’ – and the modern digital technology that allows him to create wallpapers in the shape of Ikat rugs for the Whitby Hotel in New York, paper patterned like Indian textiles for Ham Yard hotel in London, or to recreate a facsimile of Chinese hand-painted wallpapers on tough, non-woven paper. ‘When digital technology first came out it was quite basic but it’s getting better every day and it’s perfect for wallpaper as you don’t have to keep stock and you can change the colour or the scale of the design easily,’ he says. Rifling through the stacks of samples at his studio, Weston’s enthusiasm is catching. The strange spidery shape on a sample of wallpaper from the Jane Austen’s House Museum was meant to have been a rosebud, he explains, but the batch had been printed wrongly and would have been sold off cheaply – ideal for decorating the impoverished home of an as-yet-unpublished author and her widowed mother. Here too are samples of modern papers that Hamilton Weston has been promoting – beautiful hand lino-blocked wallpaper by artist Marthe Armitage (who drops in a bundle of samples as Weston chats – she’s 86 and has only just had her talent recognised), and the full-of-life sketches of Joan Evelyn Thomson, a talented artist who studied in Vienna in the Thirties, but gave it all up for motherhood; her drawings rediscovered by her granddaughter Susanna White of Whiteworks and turned into fresh, modern wallpaper. Given Weston’s passion for papers, it’s a slight surprise to walk into his living room and find the walls coated in plain paint. ‘Well, we just couldn’t decide what paper to use,’ admits Hamilton with a smile. Wealthier households had wood panels, tapestries or fabric on their walls. The earliest known English wallpaper is the Cambridge Fragment from around 1550, printed on the back of a proclamation from Henry VII. The first papers were printed on 30x36cm sheets of waste paper (the size of the sieves used in paper production), pasted on to canvas and nailed to the walls like the expensive fabric they imitated. The first rolls of wallpaper were produced by gluing together 12 sheets of rag paper to form a roll 10.05m long (still the standard length today). A background colour was painted on by hand before designs were added using wood blocks or stencils and distemper pigments. In 1690 the first flock wallpapers arrived, using shredded waste wool from the textiles industry. This was the heyday of the British wallpaper industry, and the wealthy also desired what had first become popular as a money-saver among the merchant classes. Wallpaper became so popular that in 1712 Queen Anne taxed it as a luxury item. Exports were tax-exempt and British wallpaper became famous around the world, especially in the USA, where bridegrooms often gave their wives English wallpaper. The French court began replacing tapestries with English wallpaper. Flock paper remained especially popular as it was more durable than the cut velvet it replaced, as the turpentine in the adhesive banished moths. The early 18th century saw the rise of hand-painted Chinese wallpaper featuring birds and foliage (made for export), which was more detailed than block printing but cost up to seven times as much as a roll of British paper. The mid-18th century saw a rise in papers showing architectural features or trompe l’oeil designs, such as those used by Horace Walpole at Strawberry Hill. In 1836, the tax on wallpaper was removed, coinciding with mechanisation, which allowed paper to be made on continuous rolls and printed in multiple colours on printing machines adapted from the textile industry. The first wallpaper printing machine was patented in 1839. By the mid-19th century, cheaper wood pulp replaced rag paper, bringing wallpaper within the reach of almost everybody. Production increased from 1.2 million rolls in 1834 to 32 million rolls in 1874. Designers bemoaned falling design quality. As a backlash, Pugin made traditional flock papers for the Palace of Westminster, while architect Owen Jones designed high-quality geometrical papers. The French shunned mechanisation and concentrated on hand block printing, supplying most of the quality wallpaper to the USA following independence. In the late-19th century the Victorian obsession with hygiene meant that flock was replaced by wipe-clean, varnished ‘sanitary papers’. People became aware of the dangers of arsenic in wallpaper. From 1880, block printing was revived by William Morris who created more than 50 wallpaper designs, although only the artistic middle classes bought the labour-intensive, costly papers; others were content with machine-printed copycats. This period also saw the development of deeply embossed papers. Lincrusta was launched in 1877 by Frederick Walton, the man behind Linoleum, while in 1886 TJ Palmer created lightweight Anaglypta by embossing paper pulp. In 1911, the popularity of embossed paper increased when Sanderson produced a cheaper, mass-market version. Before the First World War all four walls of a room were papered, but post-war the feature wall emerged, along with friezes and borders. The development of screen printing in the Thirties allowed papers with subtle textures and tones. In 1947, washable vinyl made it practical to wallpaper even kitchens and bathrooms, while pre-pasted paper, created in the Fifties, made hanging easier. In the Sixties and Seventies the nadir of wallpaper was reached when woodchip, invented by German pharmacist Hugo Erfurt in 1864, became the ubiquitous way to cover the nation’s walls. By the late Nineties wallpaper was embarrassingly old-fashioned, but when digital technology allowed photographic-quality printing and tiny print runs, statement wallpaper made its mark again, thanks to designers such as Sharon Elphick with her Prefab Stripe design in 1998, and Ella Doran with her massive photographic florals. The BBC show Changing Rooms promoted a resurgence of interest in wallpaper, led by the flamboyant designer Laurence Llewelyn-Bowen, who went on to become a prolific designer of wallpapers.